"Don't tell heem, Carlos. Don't be cheekin." 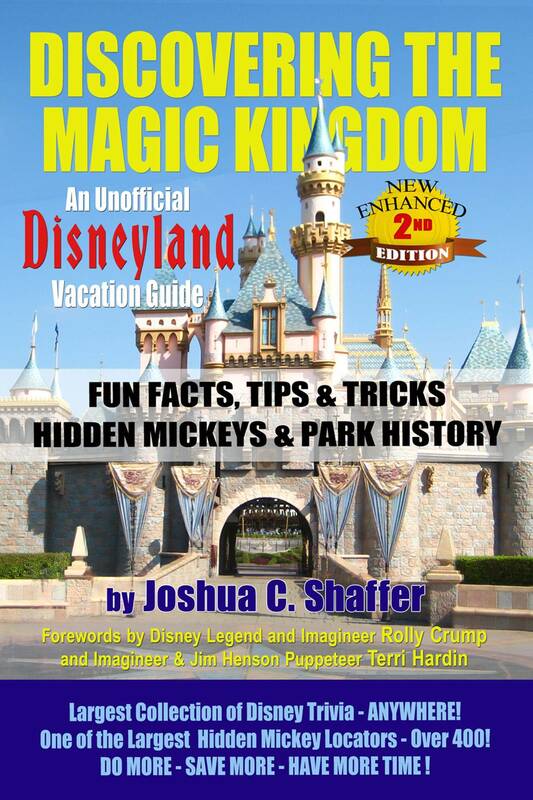 That most notable line from Disneyland's Pirates of The Caribbean was spoken by well known voice actress June Foray. June passed away at the age of 99. Here is the bio I wrote about her in my new book. 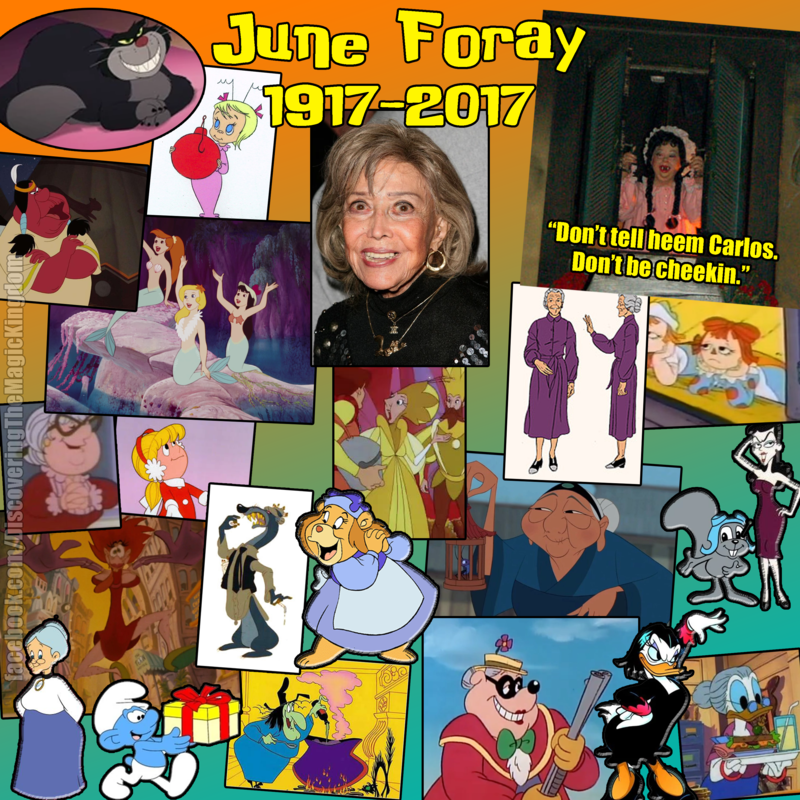 June Foray – (Born September 18, 1917, in Springfield, Massachusetts-July 26, 2017). There have been times when Mel Blanc was referred to as the male version of June Foray. June’s most notable voice role was that of Granny in the Looney Toons Sylvester and Tweety cartoons and Tiny Toons. Her career with Disney started with her role as Lucifer in Cinderella (1950). She then went on to voice the brunette mermaid (and modeled for it) and squaw in Peter Pan (1953), Mrs. Sheep in Lambert the Sheepish Lion (1952), Witch Hazel in Trick or Treat (1952), Knothead and Splinter in the Woody Woodpecker cartoons, Witch Hazel in the Looney Toons cartoons, Rocky Squirrel and Natasha in the Rocky and Bullwinkle cartoons, Cindy Lou Who in How the Grinch Stole Christmas (1966), Dorothy Gale in Off to See the Wizard (1967), Raggedy Ann in 1978 & 1979, Aunt May Parker in Spider-Man and His Amazing Friends (1981), Jokey Smurf in Smurfs (1981-1986), Wheezy and Lena Hyena in Who Framed Roger Rabbit (1988), Ma Beagle, Mrs. Featherby, & Magica De Spell in DuckTales (1987-1990), Grammi Gimmi in Adventures of the Gummi Bears (1985-1991), Norman's Aunt in Marsupilami (1992), Grandmother Fa in Mulan I (1998) & Mulan II (2004), and so many others. In Disneyland, you can hear her on Pirates of the Caribbean as Carlos’ wife shouting out the window “Don’t tell heem, Carlos. Don't be cheekin.” She also reprised her role as Wheezy the weasel for Roger Rabbit’s Car Toon Spin.